When salts dissolve in water they become ionized. In other words, they break down to the ions that formed them. 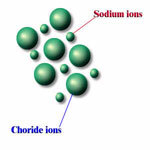 For example a solution of common salt contains sodium and chloride ions. When two salts are mixed together, different ions may react and result in new chemical products. This especially happens when one of the possible combinations are water insoluble and separate in the form of gas or solids. Knowing how the ions react with each other can help us predict and control the reactions in a direction that is beneficial for us. In this project we will gather different water soluble salts and test the reaction between those solutions. Almost all of the chemicals needed for this project can be found at home or obtained locally. More details or support for this project is available for the members of ScienceProject.com web site. Material needed for experiment can be found at home or obtained locally.